During the daily briefing at the White House Friday afternoon, Press Secretary Josh Earnest dodged questions related to Attorney General Eric Holder’s role in Operation Fast and Furious after a Vaughn Index or list of documents being held under President Obama’s assertion of executive privilege, was released yesterday by Judicial Watch. 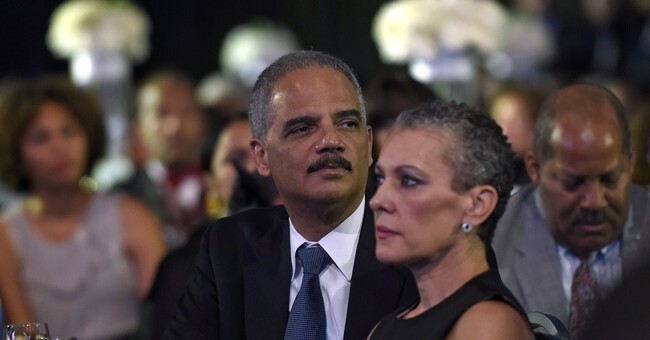 An initial review of the Vaughn Index shows 20 emails between Holder and his wife Sharon Malone and his mother were covered in the documents currently protected under Obama’s executive privilege claim. “President Obama and Attorney General Eric Holder have turned their backs on the values the American people hold dear, values particularly cherished in the black community: values like marriage, which should be strengthened and promoted, rather than weakened and undermined,” says a statement by the Coalition of African American Pastors that has been posted online with their impeachment petition. BOSTON – Federal prosecutors on Thursday announced they will seek the death penalty against 20-year-old Dzhokhar Tsarnaev in the Boston Marathon bombing, instantly raising the stakes in what could be one of the most wrenching trials the city has ever seen. Attorney General Eric Holder’s decision to press for Tsarnaev’s execution was widely expected. The twin blasts killed three people and wounded more than 260 others, and 17 of the 30 federal charges against him – including using a weapon of mass destruction to kill – carry the possibility of the death penalty. 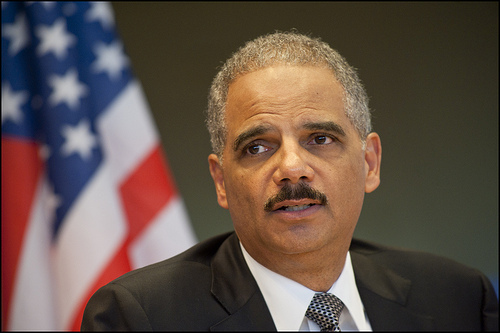 “The nature of the conduct at issue and the resultant harm compel this decision,” Holder said in a statement. You get the feeling absolutely nothing Obama says is the truth? ≈ Comments Off on You get the feeling absolutely nothing Obama says is the truth? More than a year after an FBI report indicated there was no evidence of racial bias in George Zimmerman’s history, the Justice Department is trolling for email tips on the former neighborhood watch volunteer as it weighs a possible federal civil rights case against him. Amid pressure from the NAACP and several Democratic lawmakers to pursue Zimmerman, the department has set up a public email address asking for any tips or information regarding the case. The move appears to mark an expansion of the probe, after Attorney General Eric Holder said in an address Tuesday to the NAACP that his department would “consider all available information” before deciding whether to move forward. The department also held a conference call with civil rights leaders on Monday. The conference call included DOJ officials, along with representatives from the FBI and federal prosecutors. They spoke to civil rights leaders from Sanford, Fla., as well as others from around the country. The call was convened by Tom Perez, assistant attorney general for the Civil Rights Division. Republicans on the House Judiciary Committee sent a letter to Attorney General Eric Holder on Wednesday expressing “great concern” about the possibility that Holder lied under oath during his testimony earlier this month on the Justice Department’s seizing of journalists’ records, CBS News has learned. On May 15, Holder told the committee he wasn’t involved in “the potential prosecution” of a member of the press under the Espionage Act for disclosing classified information. “This is not something I’ve ever been involved in, heard of, or would think would be wise policy,” he said. Roskam: Why Did You Tell the ABA About IRS Scandal Before Congress? ≈ Comments Off on Roskam: Why Did You Tell the ABA About IRS Scandal Before Congress? Former Internal Revenue Service (IRS) Acting Commissioner Steven Miller, who only took over in November and resigned this week at President Barack Obama’s behest, will testify before the House Ways and Means Committee Friday on his role in targeting Tea Party and conservative groups for audit or excessive review. Miller was the first senior IRS official to be disciplined in the scandal, though the problems began before he took over the IRS, and other senior officials were aware of the problem and appear to have misled Congress. Though Miller’s resignation was reported as a decisive step by the president, his term had been due to expire in early June. Joseph Grant, had been appointed only several days before as Acting Commissioner of the IRS’s tax exempt and government entities division, has also resigned. President Barack Obama dismissed calls for the appointment of a special prosecutor to investigate the IRS scandal, and evaded a question asking if White House officials knew of the IRS targeting of conservative political groups. “I can assure that I certainly did not know anything about the [inspector general] report before the IG report had been leaked through the press,” he told reporters during a Thursday lunchtime press conference held in the White House Rose Garden. Obama’s evasion will likely spur public suspicions that White House officials knew about, or even supported, the IRS targeting. On Thursday, Kansas Governor Sam Brownback received a letter from Federal Attorney General Eric Holder threatening action against the state should it enforce SB102 which Brownback signed into law last month. The bill also provides for criminal penalties against federal agents who attempt to enforce specific federal laws on guns manufactured in the state of Kansas and sold within the state – as the state takes the position under the new law that the federal government does not “interstate commerce” authority over such items. In his letter, Holder didn’t take too kindly to such a proposition. There are two ways you can relate to the entity that governs you. You are either a citizen or you are a subject. There is a significant difference between the two. This difference involves the number of rights you enjoy and the amount of freedom of action and thought you get to exercise. Tupac Shapur sums it succinctly: Real n—– do they wanna do, b—- n—– do what they can. In a philosophical sense, Senator Rand Paul just asked Attorney General Eric Holder which class we, the average American fit. Can we do what we want or do we what we can? Or more directly; can the people in charge of the government do what they want? Because if the government can do what it wants, then the people are not citizens, they are subjects, they have to do what they can.